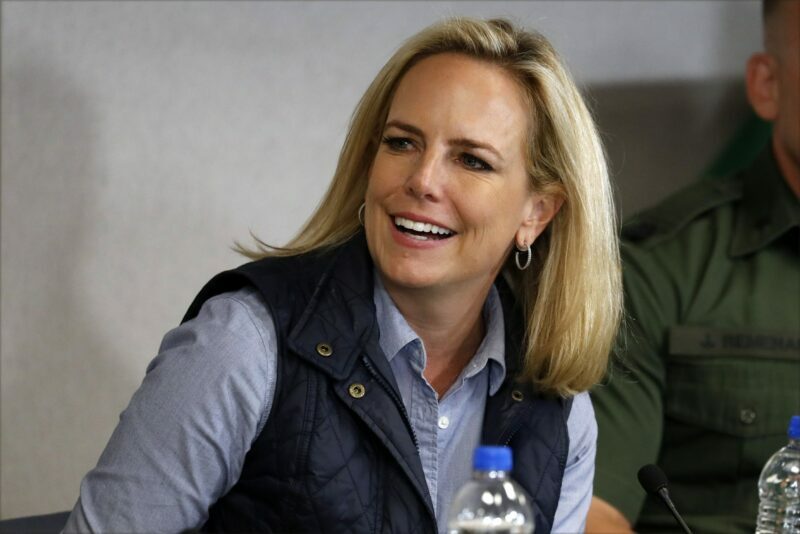 Homeland Security Secretary Kirstjen Nielsen has resigned amid President Donald Trump’s growing frustration over the number of Central American families crossing the southern border illegally. 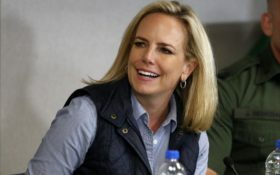 Nielsen traveled to the U.S.-Mexico border on Friday with Trump to participate in a roundtable with border officers and local law enforcement. There she echoed Trump’s comments on the escalating crisis at the border. As they toured a section of newly rebuilt barriers, Nielsen was at Trump’s side, introducing him to local officials. She returned to Washington afterward as Trump continued on a fundraising trip to California and Nevada. She went into the White House on Sunday to meet with Trump not knowing whether she’d be fired or would resign. She ended up resigning, though she was not forced to do so insiders report. Nielsen was the highest profile female Cabinet member, and her exit leaves DHS along with the Pentagon and the White House staff itself without permanent heads. Patrick Shanahan has held the post of acting defense secretary since the former secretary, Jim Mattis, was pushed out in December over criticism of the president’s Syria withdrawal plans. Acting White House chief of staff Mick Mulvaney has held his post since January, following John Kelly’s resignation last year. Tensions between the White House and Nielsen have persisted almost from the moment she became secretary, after her predecessor, Kelly, became the White House chief of staff in 2017. Nielsen was viewed as resistant to some of the harshest immigration measures supported by the president and his aides, particularly senior adviser Stephen Miller, meant to secure the U.S. southern border. Once Kelly left the White House, Nielsen’s days appeared to be numbered, and she had expected to leave last November. During the government shutdown over Trump’s insistence for funding for a border wall, Nielsen’s standing inside the White House appeared to rise. 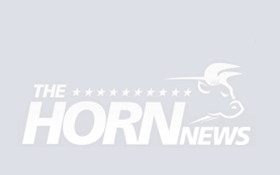 But in recent weeks, as a new wave of illegal immigration has taxed resources along the border and as Trump sought to regain control of the escalating crisis, tensions flared anew. In the face of the crisis, arrests along the southern border have skyrocketed recently. Border agents are on track to make 100,000 arrests and denials of entry at the southern border in March. A press conference to announce the most recent border numbers — scheduled to be held by McAleenan on Monday — was postponed. Nielsen dutifully pushed Trump’s immigration policies, including funding for his border wall, and defended the administration’s practice of separating children from parents after the parents were arrested. She told a Senate committee that removing children from parents facing criminal charges happens “in the United States every day.” But she was also instrumental in ending the policy. Under Nielsen, would-be illegal immigrants demanding asylum are waiting in Mexico, not released in the U.S., as their cases progress. She also moved to abandon longstanding regulations that dictate how long children are allowed to be held in immigration detention and requested bed space from the U.S. military for 12,000 people in an effort to detain all families who cross the border. Right now there is space for about 3,000 families, and facilities are at capacity.